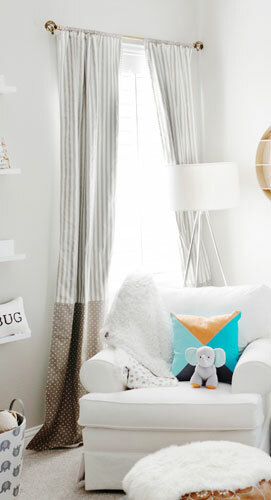 We know the ABC show The Bachelor is a big hit, but we think this adorable nursery is too! If you're a fan of The Bachelor, we think you will love the New Arrivals' nursery that welcomed Sean and Catherine Guidici Lowe's new baby boy! The nursery designed for Samuel Thomas Lowe has a warm and cozy feel featuring neutral colors and some pops of color to brighten it up and give it a retro touch. 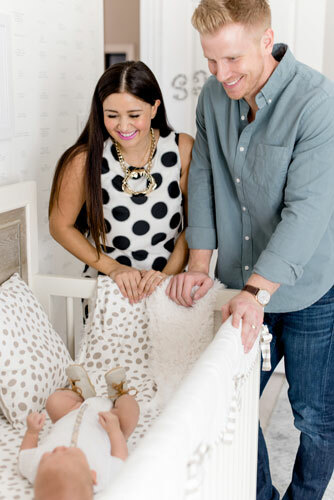 New Arrivals' owner Tori Swaim worked with Sean and Catherine Giudici to create the perfect space for their new baby Samuel Thomas Lowe. They collaborated with Wayfair to design an dreamy baby's room in Catherine & Sean's home in Dallas, Texas. We are in love with the simplicity of the nursery, and hope you are too! Before getting started on the nursery, Tori wanted to see how Catherine and Sean envisioned the nursery. Some of Catherine's design ideas for baby Samuel's nursery: "Since we won't be finding out gender (and it's our style regardless), I think it's a good idea to keep it all neutral--whites, creams, light greys--with lots of texture and playful accents. I enjoy playing with proportion and incorporating animals-polar Bears, elephants, white tigers, birds, etc.--without having it be "farm-y" but more fun! Besides aesthetic, I'm not too sure about what the room will need apart from a changing table, dresser, crib, rugs and a GREAT nursing chair (super important to me!). If you could enlighten me, I would so appreciate it! I know I'll be spending a lot of time in there so I want to make sure it's cozy for all of us!" They began the design process by creating a Pinterest board with products and ideas for the room. • Neutral Colors: We left the walls in the room a soft gray. For the crib bedding and curtains, we chose neutral khaki, gray and white fabrics. The white crib, changing table and slip covered Hailey Swivel Glider pop in front of the gray walls, and also kept with the neutral colors of the room. • Texture: We had fun with texture by adding the wooden storage bench and the slip covered cushion we covered in our soft plush sherpa fabric. The moroccan leather pouf not only gives texture, but also adds a contrast of color. Catherine loved the trend of layering rugs, so we added the white Polar Bear Faux Fur Shag rug on top of the Nasir Denim area rug which gives the room an urban vibe. • Animals: One of Catherine's favorite items on from Wayfair, were the sweet framed animal prints over the crib. Those were one of the very first items we selected for the room! The stuffed zebra was also a fun addition. 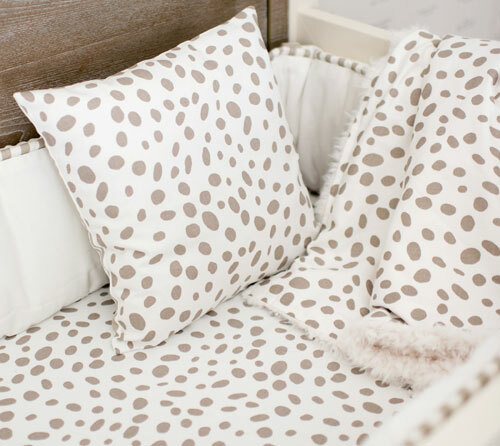 Of course, our favorite part of the nursery is the adorable Dalmatian Spots Crib Bedding designed by Catherine and Tori. Whimsical and fun, this unisex crib collection is perfect for a neutral baby's nursery. This crib set features a sweet khaki Dalmatian Spots Crib Sheet and a coordinating striped Stiped Crib Skirt. The baby blanket is backed with our super soft and plush sherpa fabric to keep your baby Samuel warm and cozy. Baby Lowe's myRoom Convertible Crib from Smartstuff Furniture makes a grand statement in the room! The light washed wood headboard paired with the white and khaki crib bedding is the perfect touch to create a comfy and rustic feel in the nursery. 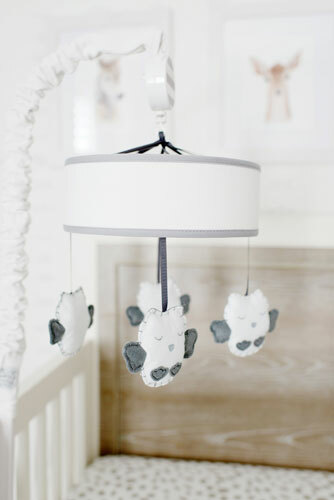 We also love the Gray Owl Baby Mobile that any baby would love to watch and fall asleep to! It plays a lullaby that will help your baby drift into a sweet peaceful sleep! The wooden storage bench is another favorite, as it adds an element of depth to the room and provides great storage to keep nursery necessities out of sight. The detailed wood draws your eye to it and gives the room texture. It was Catherine's idea to cover the bench pillow in our furry fabric. Tori accented the seat by adding fun and colorful throw pillows. The Khaki Curtains with pom pom trim are the perfect frame for the bench seat and also create a comfy sitting area. The large window gives the room an abundance of natural lighting along with a great view!